That’s right folks, we are on the move once again. This time, moving from Broadway, VA to Manchester, TN. 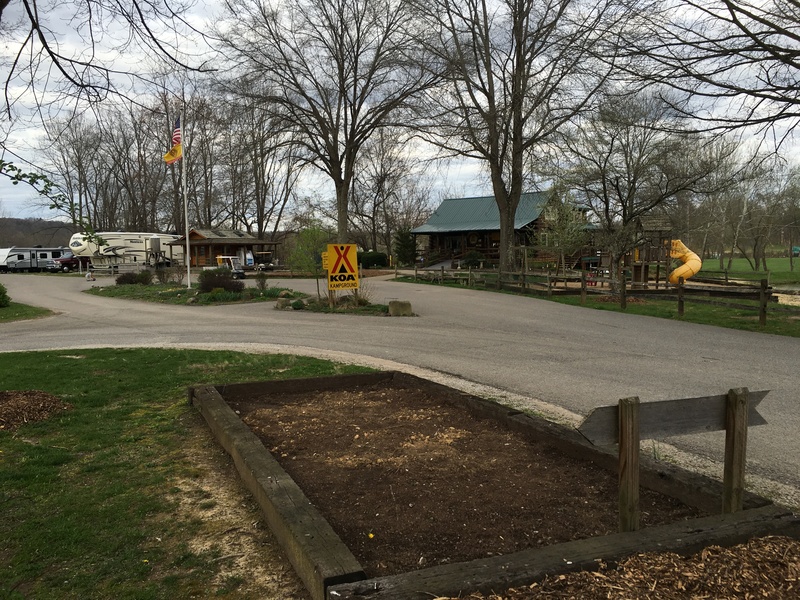 Our year at Harrisonburg/Shenandoah Valley KOA has closed and we are officially on vacation. We got a late start from Broadway yesterday, primarily because we are rusty on packing and getting on the road. When we stay in one spot for a long while, we tend to nest. Pulling up roots can be time consuming. And as we pulled out of the park, I realized I did not have my GPS set up and ready to go. So we made our first stop to get that done. That’s when I realized I still had my work radios and keys on board. Carol made a quick 4 mile trip back to the RV park to return those items while I set up my GPS. It was just past 11:00AM when we finally got on the road. Now we just need to follow the blue line. Our first destination was Huntington, WV which is west of Charleston, WV. Our trip south on I-81 was uneventful; not much traffic and excellent travel weather. We turned west onto I-64 at Lexington, VA. About 10 miles later, things got interesting. The interstate through The George Washington National Forrest was what a friend called a 40-mile roller-coaster ride. Not filled with steep climbs and descents as a roller-coaster but full of twisty turns mixed with long climbs and descents. One thing I’ve learned when making climbs in an RV is to not get stuck behind a slow-moving 18-wheeler. Well, that happened. It took a bit of an effort to get moving around that truck but Cram-A-Lot Inn met the challenge. Her GMC L18 Vortex V-8 coupled with her Allison transmission did just fine. The only thing missing was an exhaust brake system for the long descents. As we were nearing the top one of the climbs, Carol notified me that her hunger indicator had triggered. We found a safe spot to pull over on the highway and enjoyed lunch while traffic whizzed by. Most of the large trucks were courteous and pulled into the left lane as they passed us. We could tell some did not. Traffic through Charleston, WV on I-64 started to get a little heavy and there were several spots on the interstate where the turns required reduced speeds. Carol led the way through the toll plazas in Charleston. The route pretty much followed the Kanawha River which looked like a major trade artery through the area. We crossed over this river 4 times driving through Charleston. Shortly after 5PM, we pulled into our RV site for the night. Huntington/Fox Fire KOA is not a fancy place but it is a nice small park. Sites are a little close. Entry into park is a bit trick with a pretty tight switch-back turn off of US-60. 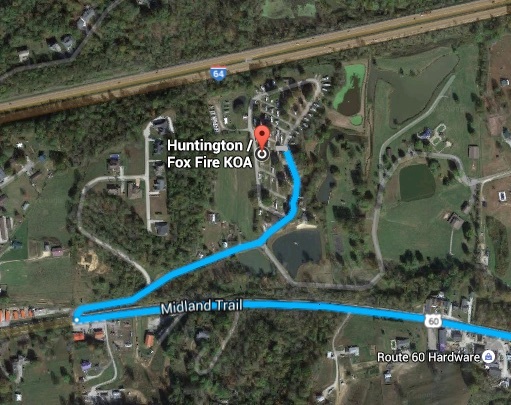 For future guests, it would be easier to enter the park by exiting the interstate at Barboursville (exit 20) and turning back towards Milton, WV so the approach to the park entrance is more direct. We made the turn just fine but we did create a small traffic delay as it took a short while for us to get complete off the road. We were planning to fix our own pizza for dinner but being road-weary, we opted to find a local spot in town. KOA office staff recommend a local burger spot named Fat Patty’s. WOW, that was one of the best burgers we’ve had in a while. I selected the Lava Patty (Red hot patty seasoned and spicy. Topped with grilled jalapeños and hot lava cayenne cheddar cheese, lettuce tomato and onion.) while Carol chose their Junior Cheeseburger. We enjoyed chatting with the staff. The fella who brought our food to us was giddy when he found we were headed to Manchester, TN. He is from that area and told us about a few things we need to check out while we are there. We returned to the RV and enjoyed a FaceTime chat with our eldest daughter and grandson (Gage). Before we said good night, our youngest grandson (Jayson) and son-in -law (Martin) popped in to say hello. It was getting late and we were having trouble our peepers open, so off to bed we went. The RV rocked a slight bit as one of two storm lines passed just south of us. Next leg of this trip takes us to Louisville, KY where we will spend a couple of days on vacation. 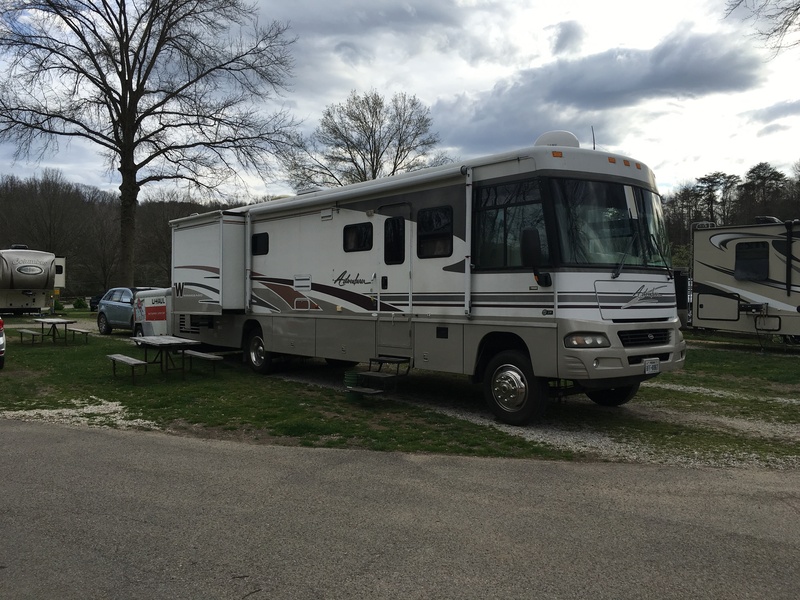 This entry was posted in Travel, Virginia, West Virginia and tagged Fat Patty's, Huntington / Fox Fire KOA, Kanawha River, KOA. Bookmark the permalink. We’ve had some interesting RV rides in WV. Will you be going over the New River Gorge? I had to close my eyes when we crossed that one! Well we did cross New River on I64 but that’s not the same. In Kentucky now and the roads more like rolling hills. Pray that you have a safe trip and enjoy your vacation time.